It snows in Minnesota. Some years a lot, other years not enough for some people. It snows early (Halloween Blizzard of 1991) and it snows late (last April was a storm that dumped over 20-inches). This is the snowiest February on record in Minnesota: 30.5 inches and counting. With a week to go in the month, more snow is expected. It snowed nearly eight inches this past Wednesday and as neighbors struggle in poorly plowed streets and snowbanks loom over my head at street corners, I think about my grandpa. It snowed 79 inches in the Twin Cities during the winter of 1951-52, following a record-setting 88.9 inches the previous winter. My grandpa (and everyone else in the Twin Cities) was doing a lot of shoveling! Click for a list of the top ten snowiest winters in the Twin Cities. This clipping may be yellowed and brittle, but it provides a clear glimpse into my grandpa’s character. When he wasn’t shoveling out fire hydrants Grandpa was an usher at church and he played chauffeur to my mom and her friends, driving them to parties and school dances before they had driver’s licenses of their own. 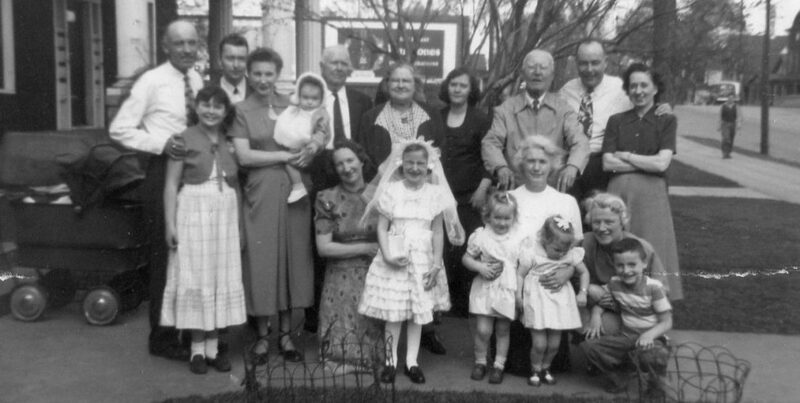 Grandpa was an only child, so he loved being part of my grandma’s expansive network of siblings, nieces, nephews, and cousins. My grandpa was many people’s first call if they ran into trouble and needed a hand. He never hesitated to do what he could to help. My grandpa was a really good guy. Categories: Irish American | Tags: fire hydrant, good guy, Minneapolis, record snowfall, Regan, snow | Permalink.